Come Be “Here” with Us at APAture’s Literary Arts Showcase Next Friday! Happy Friday, APA poetry lovers! We have an exciting bit of news to share with you this morning: in exactly a week, we’ll be heading up to San Francisco to be a part of one of the biggest APA arts events in the Bay. This year, Lantern Review is delighted to have the opportunity to copresent the literary arts showcase for Kearny Street Workshop‘s annual APAture festival, featuring poet Jade Cho, author of In the Tongue of Ghosts (First Word Press, 2016). Now in its fifteenth season, APAture, whose name plays on the photography term “aperture,” takes as its mission the goal of amplifying APA artists and giving them a stage on which to provide focus and context to their work. Fittingly, this year’s theme, “Here,” was chosen to emphasize, among other things, “the importance of APA space and community” (in the organizers’ words), even as the festival itself provides a space for investigation and celebration of the intersection of arts and social justice, innovation and disruption. For us at LR, as we continue to ease into this new, Bay Area based season of our existence, the word “here” has never felt more relevant. Before our relaunch this past spring, “here” for us quite literally meant nowhere. Mia lived on one coast, while I (Iris) bounced around from the Midwest to the East Coast to the South, and our contributing staff writers lived everywhere in between. We often used to tell people who asked that we were “based on the internet.” But when we restarted LR early this year after a cross-country move that serendipitously brought us together in the Bay Area, “here,” for the first time, became somewhere. And in the months that have followed, the experience of getting to dwell within the space of a real, physical “here” has been wonderful. From getting to host our first physical NPM collaboration in SF, where we witnessed the words and voices of six local APA poets filling up the space of the American Bookbinders Museum; to finally having the ability to sit down face to face with local LR community members for casual meals and creative exchange on a regular basis—the moments of focus provided for us in this last year by receiving from existing local community spaces and building up new ones have been havens; little islands of light dotting the everyday shoals of the necessary things we do in order to keep the lights on. “Here,” for so many years, was whatever we made of it. But at least for this small, precious sliver of current time, having a “here”—a home base, a place in which to let LR dwell and take root—has been invaluable. Throughout our history at LR, place and awareness of the liminality of “home space” for APA writers has been of utmost concern to us—it’s why we founded LR in the first place. And so, we’re beyond honored to partner with KSW, a storied organization that has been a crucial part of our new “here” and that has worked for years to build and facilitate “home space” for APA arts community in the Bay, to copresent the literary arts showcase at APAture 2016: Here. A multi-day festival featuring more than sixty up-and-coming Asian Pacific American artists in fields such as comics and illustration, film, literary arts, music, performing arts, and visual arts, APAture will take place from September 30th through October 15th at various locations throughout San Francisco. We encourage you to check out as many of the showcases and performances as you can, but in particular, we hope you’ll come join LR next Friday at the literary showcase, where Oakland-based featured poet Jade Cho will mesmerize with powerful work that explores diaspora, race, gender, ghosts, and the intersections of power and privilege. It will definitely be a can’t-miss event, and we are beyond excited to get to be there, saying a few words about LR and community and hanging out at our little table. More information about the festival can be found here. Tickets can be purchased here. Even if you can’t make the festival, we hope you’ll check out the KSW website for more information about its programs and outreach throughout the year, or that you might even consider helping to financially support APAture via its current IndieGoGo campaign. KSW and APAture are vital pillars of the APA arts scene in the Bay Area, and their tireless work has been integral in making the notion of a home space for APA artists in the Bay possible since 1972. 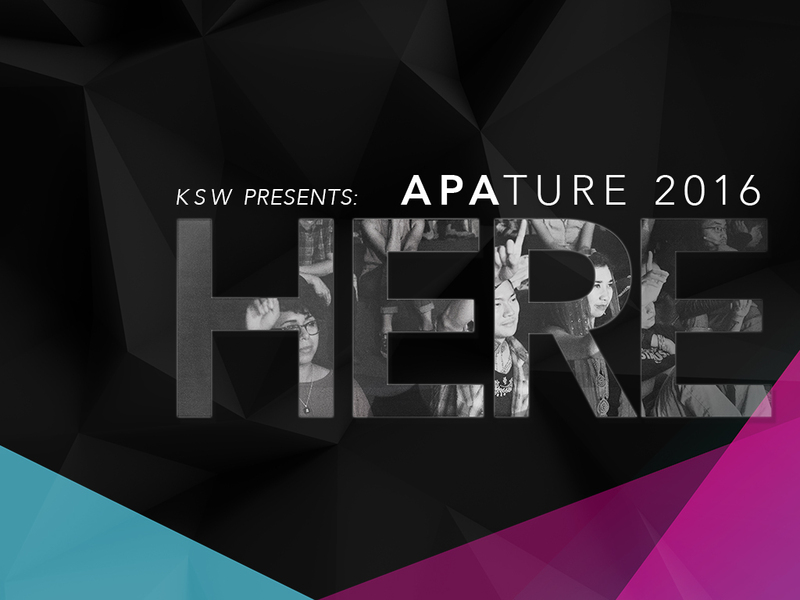 So how about it: Will you come be a part of our “here” by joining us at the APAture literary arts showcase next Friday? We certainly hope that your answer will be “yes”! This post was produced in partnership with Kearny Street Workshop. For more information about the APAture festival or about KSW itself, we invite you to check out their website at www.kearnystreet.org. For information about next Friday’s featured performer, Jade Cho, please visit her online at jadecho.tumblr.com.